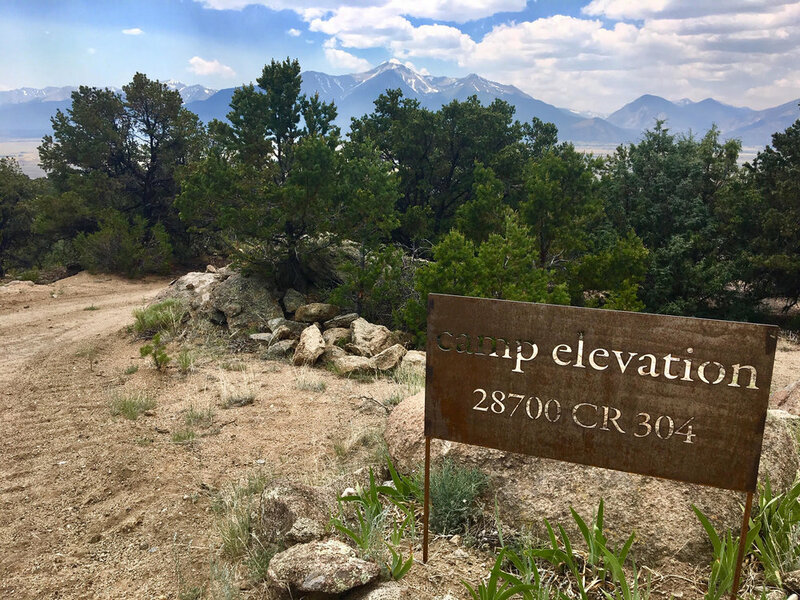 Overlooking the Collegiate Peaks & the mountain town of Buena Vista, Camp Elevation is perfectly situated for nearly any endurance adventure. Dozens of miles of single track trail & hundreds of miles of dirt roads are right outside Camp Elevation's front door. From the house, you can take a lovely 30 minute hike into downtown Buena Vista, Colorado to enjoy live music, local breweries, white water kayaking/rafting, and an active adventure culture. From Denver International Airport: Head west out of the airport towards Denver. Take East 84th (also known as Pena Blvd) until you see signs for 1-70 West. Take 1-70 around the city of Denver. You will see signs to US-285. This will be on US-285 for 140 miles. Once you pass Antero Junction you will 8 miles from the right turn onto Country Road 304. As you approach CR304 you will see signs for the Collegiate Peaks overlook, that is the same turn. Take a right onto the dirt road that is CR304. You have 3.1 miles to go. Head up CR304 to the Midland Trail Head parking lot. When you get to the parking lot look for CR304 to go left. Head left another 1.1 miles on the dirt road until you see the sign for Camp Elevation. Take a left and head down to the house. From Colorado Spring: It is 92 miles from Colorado Springs to the house, approximately 1 hour and 54 minutes. Head west out of Colorado Springs looking for Hwy 24 towards Manitou Springs. When you get to past Hartsel you will look for Antero Junction where you will turn left onto Hwy 285. You are 9 miles from the house. Before you get to the town on Johnson Village (just outside of BV) you will see signs for the Colliagate Peaks over look. That is CR 304. Turn right onto CR 304 and head up the hill on the dirt road. When you get to the parking lot (about 1 mile up the road) you must go left to continue to follow CR304. Look for the Camp Elevation metal sign which is just under 1 miles from that turn. Take the driveway down the hill to the house. From Points North (Leadville): From Leadville you are 30 miles from the house. You will head south out of town on Hwy 24 toward Buena Vista. Once you reach Buena Vista drive through town. On the outside of town you will take a left on Hwy 285 heading towards Denver, pass through Johnson Village, and past the KOA. Look for the signs that say Collegiate Peaks Overlook. Take a left onto CR 304. Head up the dirt road for about a mile. You will come to a parking lot the road continues to the left. You will drive approximately 1 mile to the metal sign that says Camp Elevation. Take a left down the driveway. From Points South (Salida): It is 21 miles from the town of Salida to the house. Head northwest out of town on Hwy 291. 291 will T into Hwy 24. Go right onto Hwy 24 through the town of Nathrop. Take a right at Hwy 285 through Johnson City and past the KOA. Look for the signs that say Collegiate Peaks Overlook. Take a left onto CR 304. Head up the dirt road for about a mile. You will come to a parking lot the road continues to the left. You will drive approximately 1 mile to the metal sign that says Camp Elevation. Take a left down the driveway. There is a Greyhound Bus that runs from once at day from Denver, usually at 1:45pm and arrives in Buena Vista, Co at 4:30pm. It costs $24. If you fly into DIA, you would take the train for $9, (37 minute trip) to downtown, Union Station, Denver and then catch the bus to Buena Vista, CO.